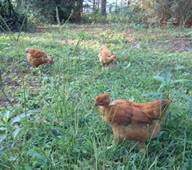 Free range chicks enjoy an assortment of pasture grasses and seeds in addition to their certified-organic feed. Welcome to our Farm. Located in the Wiregrass region of South Alabama, we experience a nearly year round growing season. The Drought of 2006 has been unkind to our vegetable crops and fruit trees, but hasn’t affected our chickens at all. We have been using sustainable agriculture methods in our gardens for nearly 20 years. This means, as one of our boys points out, “We feed the earth and it feeds us. Isn’t that right, Daddy?” Our soils are amended with good-for-it compost and that’s about it. Click “About Us” to learn more about how we grow your food.